My friend Michelle first made this recipe for us in college and it tends to make an appearance at most barbeques and cookouts that we have now. Its a great light side dish that's a different alternative to pasta salad or potato salad. The salad comes together really easy with just a few simple ingredients and its a great budget dish. One note of caution on this salad, add the dressing just before you serve it so it doesnt get soggy. It also doesnt keep super well because the cabbage tends to wilt after its dressed so don't plan on having a lot of leftovers. You can garnish with sunflower seeds or toasted almonds or both, whichever you prefer. Fill a large bowl with water, add ramen noodles and soak until soft, about 5-10 minutes, drain and pull apart with your hands. 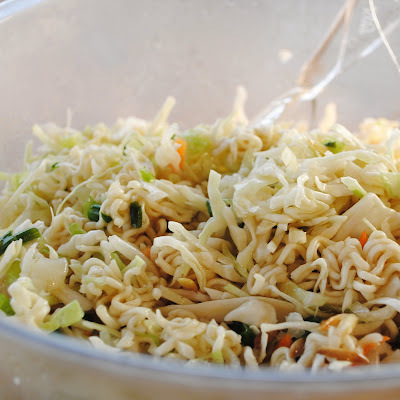 In a clean, dry bowl, add noodles and cabbage mix. Toast almonds in a small dry skillet. Add green onions and almonds to cabbage mix. In a separate bowl or jar, mix oil, vinegar, sugar and spice packets from ramen noodles. Just before serving, add dressing to the cabbage mix and toss together. 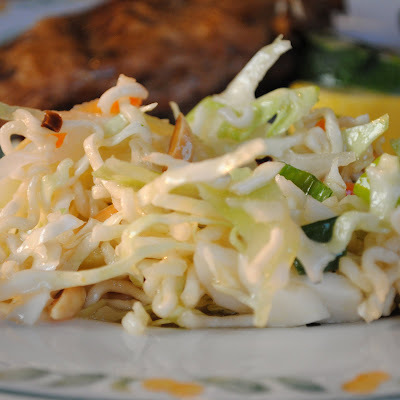 If you want a twist on this, sometimes I use broccoli slaw instead of the cabbage. It is a bit crunchier. I also through in dried cranberries. One of our favorites! I've made it with broccoli slaw or a mixture before as well - it does add a great crunch. Never thought about dried cranberries, that sounds good. Thanks! I put poppy seed dressing and no oil and add some raisins!! YUM!! !